This page shows an overview of future activities. For some activities there is the possibility to sign up on line. The iCal and RSS feeds can be found on the top of the page. By signing up for an activity you give permission for the processing of the photos taken during this activity. On behalf of Innovatie Cluster Drachten Dr Ir Albert Jan Boonstra from Astron will give a lunchlecture. The lecture will be about artificial intelligence of the LOFAR radiotelescope. The LOFAR radiotelescope from Astron consists of 100.000 antennas that catch weak signals from space. A complex system of hardware and software translates these signals to star maps. On daily basis datasets are produced of about 100 terabyte. Yearly 7 petabyte of compressed data is saved in the archives. This data has to be checked on correctness. Systemfaults, as malfunctioning of a part of the antennas, an amplifier or a data transport connection, have to be found. Then they have to be mentioned to the astronomer that uses this data for his research. Finding all faults in such a big data system as LOFAR is not easy, since it is a complex system and a big amount of data. Manual inspection is not possible, one observation is around 8000 pictures. Artificial intelligence is the solution! It appears that a neural network is suitable to automatically detect malfunctioning. In the lecture I will give more information on the LOFAR radiotelescope, the challenge to find the malfunctions and the first results of the neural network at work. 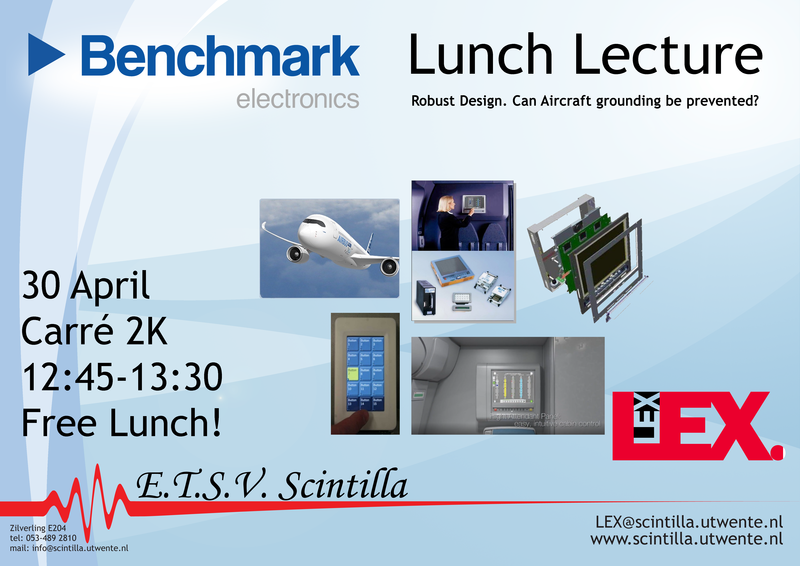 So come by for an interesting lecture and free lunch! Are you just as excited as we are? 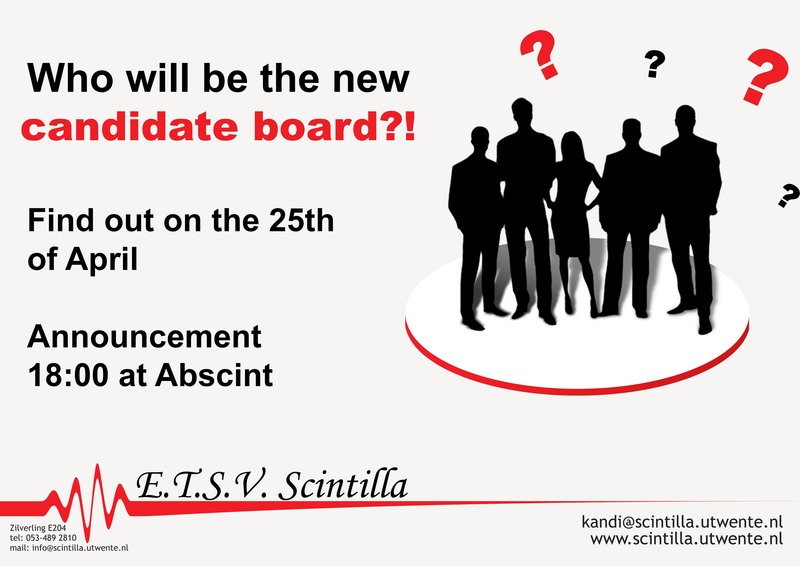 Come enjoy a beer (or any other beverage) and see who are in the candidate board of the 90th board of E.T.S.V Scintilla. Since a couple of years Dutch students get a student loan instead of a scholarship. By the introduction of this policy, a budget has become available which can be used to improve the quality of education. A special feature of this budget is that the opinion of teachers and students is also taken into account. What does this mean? You get to determine what topics should get more attention! In this lunch we will give you more information on the ins and outs of these “Quality Agreements”. After this we will hold a discussion to come up with points that you really want to see in the educational system or points that can improve the study. Past year some of the budget was already used. 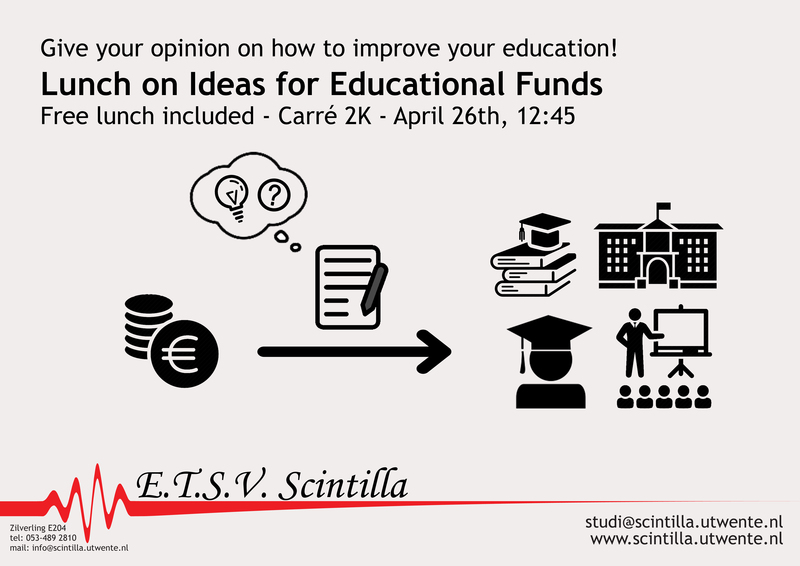 Scintilla itself got a budget to offer better and more diverse courses, which we do with MasterCLASS. Besides this, the faculty is trying to create more space for both lecture halls and study spaces. In addition to this, the MyDAC is currently given to the first year students for free, with a €100,- deposit. In the previous years students had to buy these devices with a possibility to sell them for 50% of the price. Other effort has been put in more actual teaching time for teachers by relieving them of the administration, an increased space for laboratories and more power sockets in project rooms. It is like clockwork: every friday from 4pm there is a friday afternoon drink in the Abscint. Scintilla, Inter-Actief, Abacus and Proto take turns at organising this drink and all members of these associations are welcome to cheer at the start of the weekend. A new edition of the well-known Staf-Tournament. Sign up now! Robust Design. Can Aircraft grounding be prevented? Failing electronics/software in an Aircraft can lead to grounding the Aircraft. Is it possible to prevent making this happen? A lecture by Jippe Rossen and Henry Kompagnie about lessons learned, qualification mishaps, problem investigations, truth of reliability calculations. Movies, popcorn and craft beer: the best ingredients for a fun evening to come together with your friends and forget about your study stress for a moment. This evening we'll have some of the best films and most delicious popcorn ready for you and your friends. See you there! Io vitvat! Io vivat, Nostrorum sanitas! 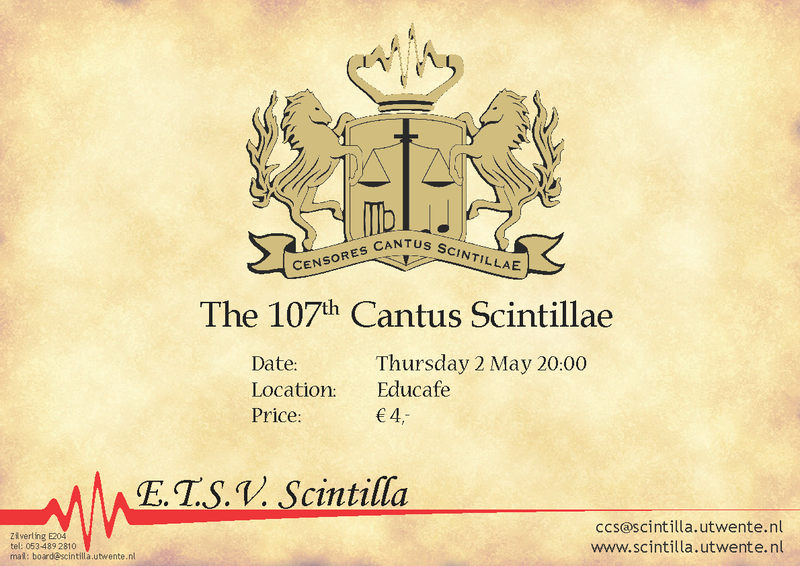 Come join us for one of Scintilla's most famous activities, the cantus. Hungry of all that running? Sign up for the batavieren barbecue! This lunch lecture will be about 'Passive logic'. On the 16th of May the legendary Elfbierentocht will take place. This is the biggest campus pub-crawl where you visit all drinking rooms of the study associations and end in the Vestingsbar. For just €9 you will get, as the name suggest, 11 beers. And for just €5 more you get unlimited food at the end of the pub-crawl. The sign-ups open on the 16th of April at 13:00! Prepare yourself for the best excursion of the year, for we will travel to the far north to visit the largest allience of the north of the Netherlands: the innovationcluster Drachten. Sign up quickly, diner, lunch and transport are included! Together we will be fixing the beerbanches and tables. After a long year of studying, its almost time... Time for celebrating your first 60 EC's! Of course that means; partying! Come and join the SKIC for a fantastic BBQ to celebrate your well-deserved EC's. Sign up now! On this day we will together with abacus go to index. Index is a big party just across the border in Germany. We will go together with the bus, after which everybody is free to party and do whatever he or she likes. Have you always wanted to have a go at pole dancing? Time to turn that dream into reality! 27th of May, Stellae will organise a 2 hour poledance workshop. Together with the other EEMCS-associations we will visit Budapest during the ascension weekend. Be sure to join us for a long weekend filled with fun! !